We found seven scripts collecting Facebook user data using the first party’s Facebook access . These scripts are embedded on a total of 434 of the top 1 million sites, including fiverr.com, bhphotovideo.com, and mongodb.com. We detail how we discovered these scripts in Appendix 1 below. Most of them grab the user ID, and two grab additional profile information such as email and username. We believe the websites embedding these scripts are likely unaware of this particular data access . The user ID collected through the Facebook API is specific to the website (or the “application” in Facebook’s terminology), which would limit the potential for cross-site tracking. But these app-scoped user IDs can be used to retrieve the global Facebook ID, user’s profile photo, and other public profile information, which can be used to identify and track users across websites and devices . * OnAudience stopped collecting this information after we released the results of a previous study in the No Boundaries series, which showed them abusing browser autofill to collect user email addresses. ^ Although we observe these scripts query the Facebook API and save the user’s Facebook ID, we could not verify that it is sent to their server due to obfuscation of their code and some limitations of our measurement methods. While we can’t say how these trackers use the information they collect, we can examine their marketing material to understand how it may be used. OnAudience, Tealium AudienceStream, Lytics, and ProPS all offer some form of “customer data platform”, which collect data to help publishers to better monetize their users. 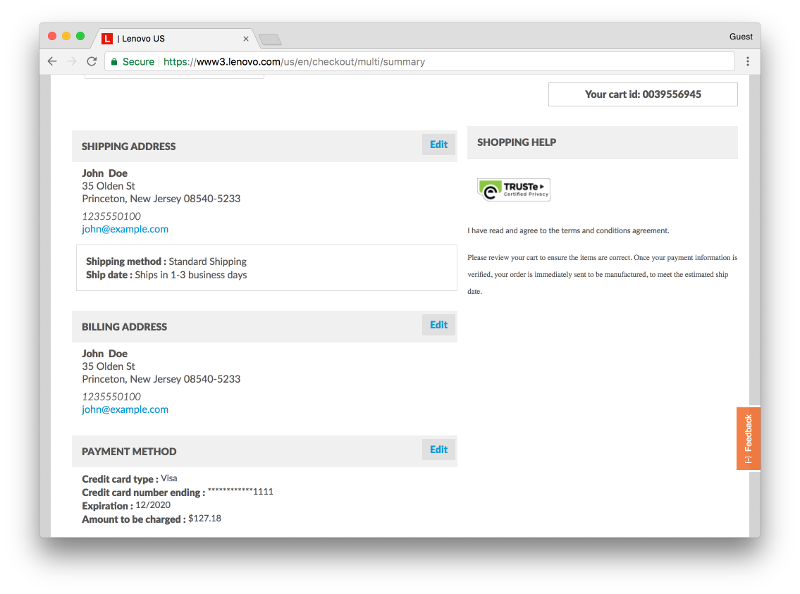 Forter offers “identity-based fraud prevention” for e-commerce sites. Augur offers cross-device tracking and consumer recognition services. We were unable to determine the company which owns the ntvk1.ru domain. Some third parties use the Facebook Login feature to authenticate users across many websites: Disqus, a commenting widget, is a popular example. However, hidden third-party trackers can also use Facebook Login to deanonymize users for targeted advertising. This is a privacy violation, as it is unexpected and users are unaware of it. But how can a hidden tracker get the user to Login with Facebook? When the same tracker is also a first party that users visit directly. This is exactly what we found Bandsintown doing. Worse, they did so in a way that allowed any malicious site to embed Bandsintown’s iframe to identify its users. We discovered that the iframe injected by Bandsintown would pass the user’s information to the embedding script indiscriminately. Thus, any malicious site could have used their iframe to identify visitors. We informed Bandsintown of this vulnerability and they confirmed that it is now fixed. This unintended exposure of Facebook data to third parties is not due to a bug in Facebook’s Login feature. Rather, it is due to the lack of security boundaries between the first-party and third-party scripts in today’s web. Still, there are steps Facebook and other social login providers can take to prevent abuse: API use can be audited to review how, where, and which parties are accessing social login data. Facebook could also disallow the lookup of profile picture and global Facebook IDs by app-scoped user IDs. It might also be the right time to make Anonymous Login with Facebook available following its announcement four years ago. Steven Englehardt is currently working at Mozilla as a Privacy Engineer. He coauthored this post in his Princeton capacity, and this post doesn’t necessarily represent Mozilla’s views. We use the term “vulnerability” to refer to weaknesses arising from insecure design practices on today’s web, rather than its commonly understood sense in computer security of weaknesses arising due to software bugs. In this post we focus on websites which use Facebook Login, but the vulnerabilities we describe are likely to exist for most social login providers and on mobile devices. Indeed, we found scripts that appear to grab user identifiers from the Google Plus API and from the Russian social media site VK , but we limited our investigation to Facebook Login as it’s the most widely used social SDK on the web. In order to better understand the level of integration a third party has with the first party, we categorize scripts based on their use of the first party’s Application ID (or AppId), which is provided to Facebook during the login initialization phase to identify the site. Inclusion of a site’s application ID and initialization code in the third-party library suggests a tighter integration—the first party was likely required to configure the third-party script to access the Facebook SDK on their behalf. While application IDs aren’t meant to be secrets, we take the lack of an App ID to imply loose integration—the first party may not be aware of the access. In fact, all of the scripts in this category take the same actions when embedded on a simple test page with no prior business relationship. 1) third-party initiates the Facebook login process instead of passively waiting for the login to happen; 2) third-party includes the unique App ID of the website it is embedded on. The seven scripts listed above neither initiate the login process, nor contain the app ID of the websites. Still, it is very hard to be certain about the exact relationship between the first parties and third parties. The application-scoped IDs can be resolved to real user profile information by querying Facebook’s Graph API or retrieve the user’s profile photo (which does not even require authentication!). When security researchers showed that it is possible to map app-scoped IDs to Facebook IDs and download profile pictures Facebook responded as follows: “This is intentional behavior in our product. We do not consider it a security vulnerability, but we do have controls in place to monitor and mitigate abuse.” A Facebook interface with similar controls was reportedly used to harvest of 2 Billion Facebook users’ public profile data. Note that although the endpoint found by the researchers does not work anymore, the following endpoint still redirects to users’ profile page: https://www.facebook.com/[app_scoped_ID]. To study the abuse of social login APIs we extended OpenWPM to simulate that the user has authenticated and given full permissions to the Facebook Login SDK on all sites. 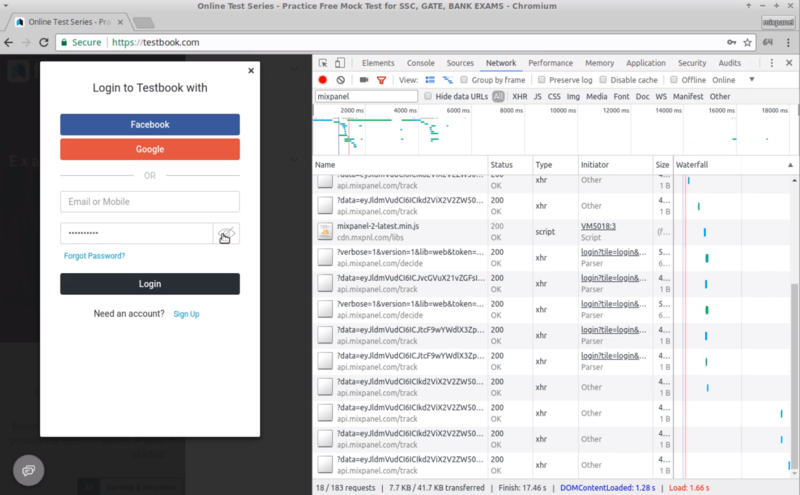 We added instrumentation to monitor the use of the Facebook SDK interface (`window.FB`). We did not otherwise inject the user’s identity into the page, so any exfiltrated personal data must have been queried from our spoofed API. As in our previous measurements, we crawled 50,000 sites from the Alexa top 1 million in June 2017. We used the following sampling strategy: visit all of the top 15,000 sites, randomly sample 15,000 sites from the Alexa rank range [15,000 100,000), and randomly sample 20,000 sites from the range [100,000, 1,000,000). This combination allowed us to observe the attacks on both high and low traffic sites. On each of these 50,000 sites we visited 6 pages: the front page and a set of 5 other pages randomly sampled from the internal links on the front page. For method calls that normally return personal information we spoof the return values as if the user is logged in and call and necessary callback function arguments. These include `FB.api()`, `FB.init(), `FB.getLoginStatus()`, `FB.Event.subscribe()` for the events `auth.login`, `auth.authResponseChange`, and `auth.statusChange`, and `FB.getAuthResponse()`. For the Graph API (`FB.api`), we support most of the profile data fields supported by the real Facebook SDK. We parse the requested fields and return a data object in the same format the real graph API would return. For method calls that don’t return personal information we simply call a no-op function and ignore any callback arguments. This helps minimize breakage if a site calls a method we don’t fully replicate. We fire `window.fbAsyncInit` once the document has finished loading. This function is normally called by the Facebook SDK. We also found a number of third-party scripts interacting with the Facebook API, which appear to be operating on behalf of the first party . These companies offer a range of services, such as integrating multiple social login options, monitoring social media engagement, and aggregating customer data. As a specific example, BlueConic offers a Facebook Profile transfer service, that copies information from the user’s Facebook profile information to BlueConic’s data platform. Additional third-party services which access Facebook profile information on the first party’s behalf include: Zummy, Social Miner, Limespot (personalizer.io), Kissmetrics, Gigya, and Webtrends. In our research we found password leaks to four different third-party analytics providers across a number of websites. The sources are numerous: several variants of a “Show Password” feature added by site owners, an unexpected interaction with an unrelated third-party script, unanticipated changes to page structure by browser extensions, and even a bug in privacy tools of one of the analytics libraries. However, the underlying cause is the same: wholesale collection of user input data, with protection provided by set of blacklist-based heuristics to filter password fields. We argue that this heuristic approach is bound to fail, and provide a list of examples in which is does. Many websites implement mobile-friendly password visibility toggles which make it possible to “unmask” the entered password and check it for errors. In order to implement this, the user’s password must be placed in a field that doesn’t have its “type” property set to “password”, since browsers will automatically mask any text entered into those fields. We found leaks due to several variations of this feature, including to Mixpanel (A.1), to FullStory (A.2), and to SessionCam (A.3). Sites may include a number of third-party scripts which alter or annotate the page in unexpected ways. In the example given in (A.4), a third-party analytics script from Adobe stored the typed password in a cookie when the password field clicked. On the same page, session replay script from Userreplay collects all cookies, effectively causing the password leak to Userreplay. Even in cases where publisher sites take an active role to prevent leaks to third parties, things can go wrong. Passwords were leaking to FullStory (A.5) due to a bug in one of their redaction features. The feature was implemented in a such a way that, when applied to a password input, the password would leak to FullStory, but would not be displayed in the resulting session recording that the publisher could later review. Thus, it would be difficult for a publisher to discover the leak. In their announcement, Mixpanel explained that “[the password leak] could happen in other scenarios where browser plugins (such as the 1Password password manager) and website frameworks place sensitive data into form element attributes.” The problem is not limited to a small set of browser extensions, but rather any extension which alters the page structure. Neither the site owner nor the analytics provider can be expected to anticipate all possible structural changes an extension might perform. As an example, we examined browser extensions which automatically make password fields visible to the user. There are a ton of such extensions, which are collectively used by 120,000+ users. We found that users of the Unmask Password and Show Password Chrome extensions would, on some sites, have their passwords leaked to Mixpanel (A.6) and FullStory (A.7) respectively. In both cases the leaks were caused by a variant of the “Show Password” feature described above. The Autotrack feature allows sites to collect interaction events on a website, like clicks or form interactions, without needing to specify which elements to monitor. The automated collection of all interactions, including values entered into input fields, is the service’s main selling point: if a site owner ever wants to start monitoring a new input field, Mixpanel will already have the complete history of the various inputs provided by the visitors for this field. Autotrack doesn’t appear to be designed to collect sensitive data. Instead, Mixpanel suggests sites can use the service to perform benign analytical tasks, like finding the commonly used search terms. However, sites collect all types of sensitive data through input elements: usernames and passwords, health information, banking information, and so on. Automatically determining which fields are sensitive is a difficult task, and an incorrect classification runs the risk of scooping up the sensitive user data — even if the user never submits the form . Similar to the session replay scripts we studied in the past, Mixpanel implements several heuristics  in attempt to automatically exclude specific types of sensitive information from collection. The rules most relevant to password fields are: remove any input field which is of the password type or has a name property (or “id” property, if name does not exist) that contains the substring “pass”. Mixpanel also offers sites the ability to manually exclude parts of the page, which we discuss later in the post. Mixpanel attributed the cause of their previous password leak to a change in another third-party library. The third-party library “placed copies of the values of hidden and password fields into the input elements’ attributes, which Autotrack then inadvertently received”. Indeed, the previous version of Autotrack only filtered password fields’ “value” property, which stores the password entered by the user. The attributes of the field, which can be used to add arbitrary metadata about the password field is left unfiltered. The fix deployed by Mixpanel changed this, filtering both the value property and all attributes from password fields. This plugs that specific hole, but as the Testbook example (A.1) shows, sites may handle sensitive data in other ways Mixpanel didn’t predict. “Show Password” feature is commonly implemented by switching the “type” property of the password input field from “password” to “text”. The majority of the leaks examined above were caused by the mobile-friendly “Show Password” option. This feature is commonly implemented by switching the “type” property of the password input field from “password” to “text” (see: 1, 2, 3). The feature can be implemented by the first party directly or by a browser extension. 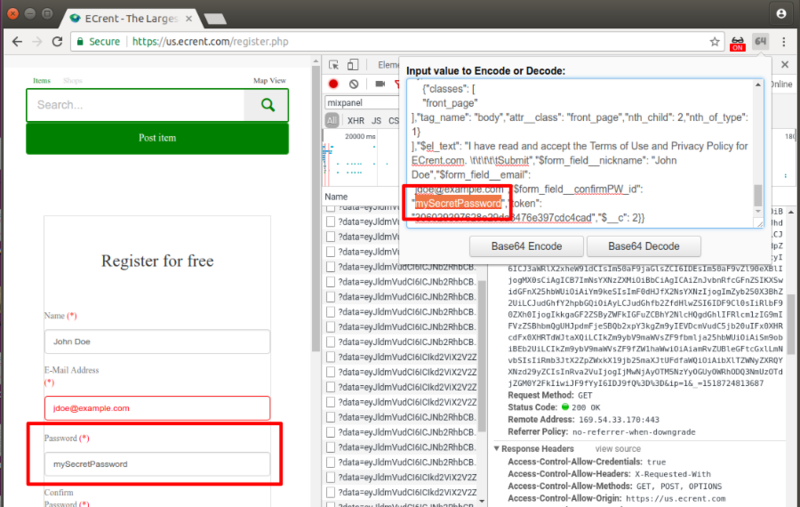 In fact, this is how the Unmask Password extension is implemented, and was the cause of the ECRent password leak (A.6). The third-party scripts we studied don’t filter generic text fields as strictly as password fields. This is also the primary cause of the leaks on Testbook (A.1), PropellerAds (A.2), and johnlewis.com (A.3). It may be tempting to filter passwords stored in generic text fields based on other properties of the input field, such as the name, class, or id. Mixpanel’s relatively simple implementation of this filtering  provides a perfect case study of this mitigation: it excludes generic text fields which contain the substring “pass” in their “name” attribute (or “id”, if “name” does not exist). Using our crawl data we found that 15% of the 36,972 total password fields discovered will not match this substring filter. Indeed, the third most frequent password field name attribute “pwd” would be missed, as will common translations of “password”. A word cloud of the 50 most commonly missed terms is given in footnote . Of course Mixpanel’s heuristic could be updated to include these new fields, but that would just continue the game of whack-a-mole. There will inevitably be another password field formatted or handled in a way that this new heuristic fails to handle and user passwords will continue leaking. Mixpanel offers developers a way to manually specify fields that should be excluded from collection. Developers can simply add the class `mp-no-track` or `mp-sensitive` to an element to prevent sensitive information leaks. Indeed, this was the solution Mixpanel recommended in their response to our disclosure . At first glance this might seem to mitigate the problems outlined in this post — anything missed by the automatic filtering can simply be manually filtered by the site. However, our research into session replay scripts found that companies repeatedly failed to prevent data leaks through manual redaction. In Mixpanel’s case, redaction feature is will negate the main benefit of Autotrack – collection without a manual review of the fields. We signed up for a Mixpanel account and enabled Autotrack in the dashboard . During the process, we didn’t see any warnings about the risks of Autotrack, nor could we find a way to review all of the collected data. To discover the collected passwords, we needed to manually add an “event probe” to the password field or login form. This may explain why it took over 9 months for a Mixpanel user to discover the inadvertent password collection introduced back in March 2017, despite its presence on 4% of Mixpanel’s projects. We focus on password fields in this post because they are the most constrained user input and should be the easiest to redact. Despite this, several of the major input scraping scripts are still unable to prevent password leaks. Financial, health, and other sensitive data are often collected using generic “text” fields which may have ambiguous input labels. We expect them even more difficult to filter in an automated way. We show that the indiscriminate collection of form data is a security disaster waiting to happen. We’ve highlighted these risks before, and the analysis included in this post shows that the problem persists. We don’t view these issues as bugs to be fixed, but rather vulnerabilities inherent to this class of analytics scripts. The Autotrack feature allows sites to collect analytics on form interactions such as when checking out products or signing in to your account. Mixpanel Autotrack normally tries to exclude password fields from the collected data, but A1the filtering relies on fragile assumptions about page composition and markup. Fig 1. Password collection by Mixpanel on testbook.com. 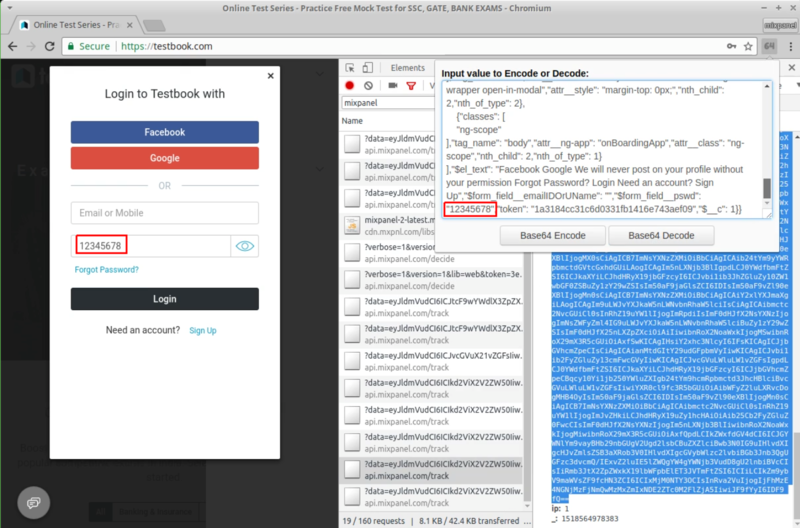 One of the password leaks occurs on testbook.com’s  login form when a user makes use of the “Show Password” feature, which causes the user’s password to be displayed in cleartext. Once the user takes a further action, such as editing the password or hiding it again, the password will be collected by Mixpanel. The collection happens regardless of whether the user ultimately submits the login form. We reported the issue to Mixpanel. Their response can be found in . Mixpanel currently lists the Autotrack feature as “on hold”, and appears to have disabled it for new projects. But sites that were already using Autotrack at the time of the incident are not affected by this change. A2. Password collection due to a “Show password” feature: The PropellerAds’ login form contains an invisible text field, which also holds a copy of the typed password. When a user wants to display the password in cleartext, the password field is replaced by the text field. FullStory’s auto exclusion filters fail to recognize the password in the text field, which causes the password to be collected by FullStory. We reported this issue to FullStory and PropellerAds. FullStory responded promptly and said that “[they] are in touch with the customer to ensure that all inappropriate data is deleted and that they update their exclusion rules to comply with our Acceptable Use Policy.” FullStory’s complete response can be found in . Fig 2. 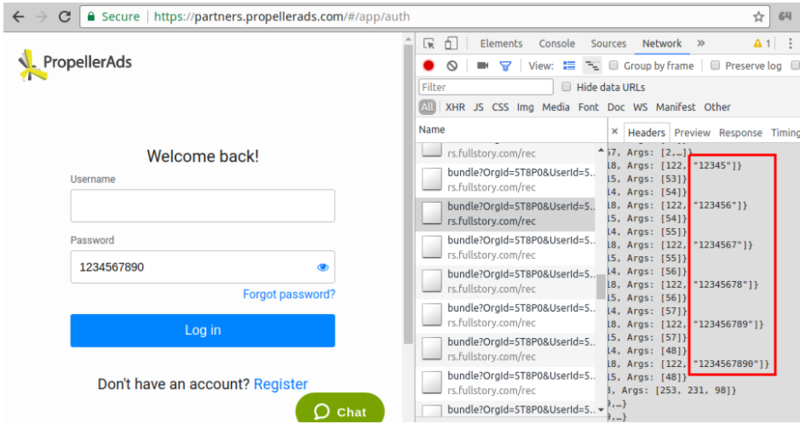 Password is collected on PropellerAds’ login form by FullStory. 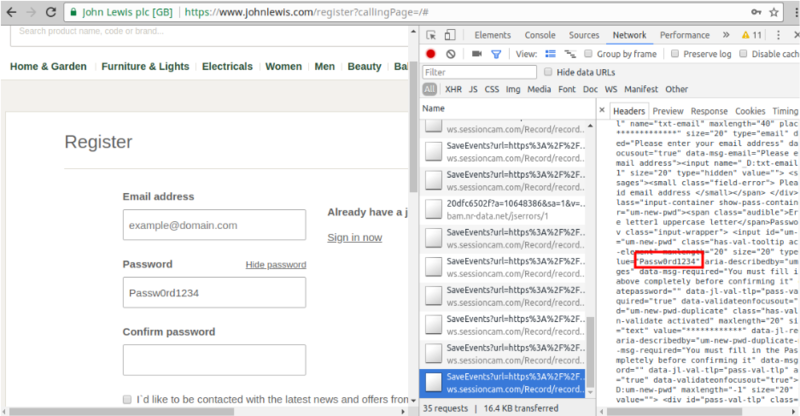 The registration page of the johnlewis.com website implements the “Show password” feature in the same way as PropellerAds: a copy of the password is always stored in an invisible text field, which replaces the password field when users want to show their password. This time session replay script from sessioncam.com fails to filter out passwords in the text field and sends it to its servers. We reported the issue to SessionCam and johnlewis.com. Response from Sessioncam can be found in . On both of these cases (johnlewis.com and propellerads.com) password is grabbed by the session replay scripts even if the user does not make use of the Show/Hide password feature. Fig 3. Password leaks to Sessioncam on johnlewis.com. A4. Password leaks due to interaction with other analytics scripts. 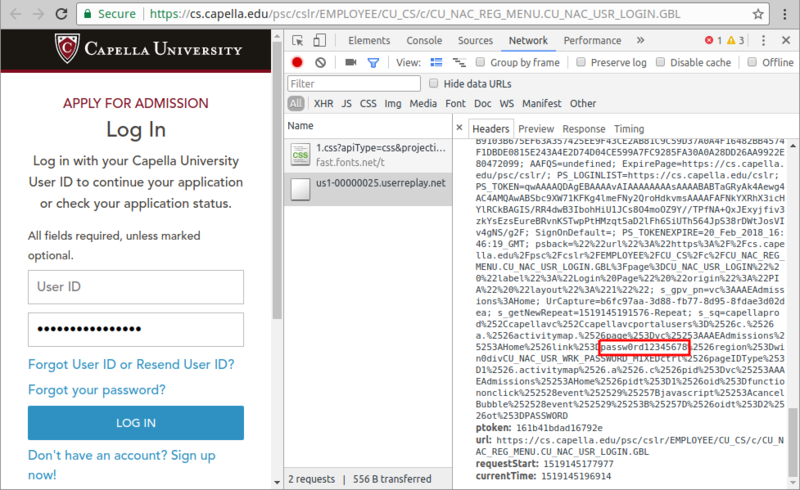 Passwords on Capella University’s admission login page leaks due to an unexpected interaction of different third-party scripts. When a user clicks on the password field, Adobe’s Analytics ActivityMap script stores the password in a cookie called “s_sq”. 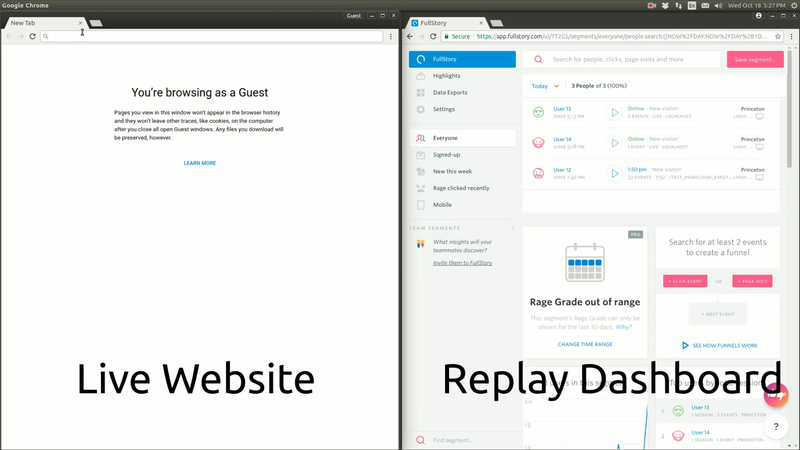 On the same page, session replay script from Userreplay collects and sends all cookies, which effectively cause passwords to be collected by Userreplay. Fig 4. The password stored in the cookies are leaked to Userreplay on Capella.edu website. 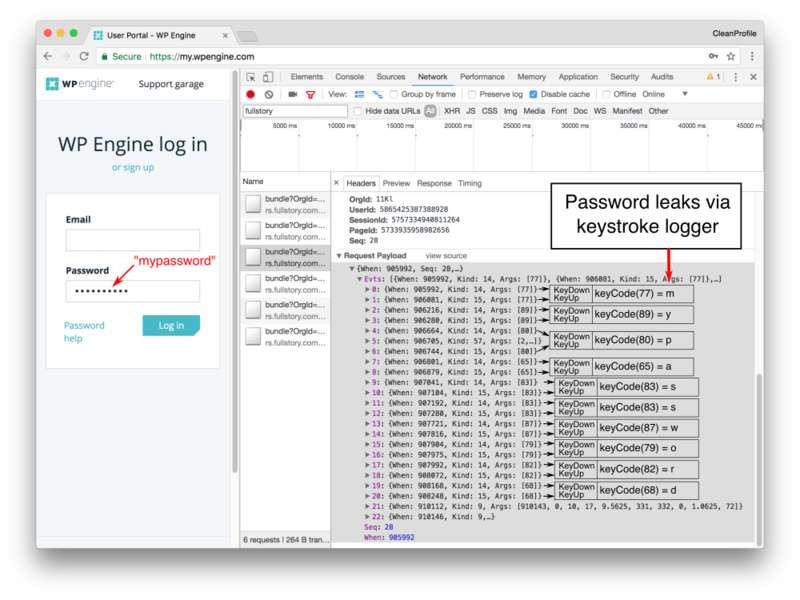 Fig 5: The WP Engine login page leaks passwords via FullStory’s keystroke logger. We decode the keyCode values sent to FullStory to demonstrate that they match what was typed into the password field. In the screenshot above, we demonstrate how passwords entered on WP Engine’s login page leak to FullStory via their keystroke logger. From what we can tell, this leak is the result of WP Engine taking proactive steps to protect user data. Rather than relying on FullStory’s automatic exclusion of password fields, WP Engine added FullStory’s manual redaction tag (i.e., `fs-hide`) to the field. FullStory’s documentation explains that fields hidden with the `fs-hide` tag will not be visible in recordings, and that “some raw input events (e.g., key and click events) are also redacted when they relate to an excluded element.” Through manual debugging, we observed that the use of `fs-hide` tag changed the way FullStory’s script classifies the password field, eventually causing it to collect the password. Following our disclosure, FullStory promptly fixed the issue and released a security notice to their customers, stating that the bug affected less than 1% of sites. Fig 6. Mixpanel will collect passwords on ECrent registration page when the Unmask Password Chrome extension is in use. The password leaks in a base64 encoded query string to Mixpanel. ECrent is a rental platform that was in the Alexa top 10,000 sites at the time of measurement. Fig 7. FullStory will inadvertently collect passwords when the Show Password Chrome extension is in use. Similar to the Propeller Ads example above, this extension implements the show password functionality by swapping the current password field with a new cleartext field. The new field is not excluded from FullStory’s recordings — any further edits to the cleartext will cause password to be collected by FullStory. We thank Jonathan Mayer for his valuable feedback. Our rationale for publicizing these leaks is not to point fingers at specific first or third parties. Mixpanel, for example, handled their previous password incident quickly and with transparency. These aren’t bugs that need to be fixed, but rather insecure practices that should be stopped entirely. Even if the specific problems highlighted in this post were fixed, we suspect we’d be able to continue to find variants of the same leaks elsewhere. Thankfully these password leaks can’t be exploited publicly, since the analytics data is only available to first parties. Instead, these leaks expose users to an increased risk to data breaches, an increased potential for data access abuse, and to unclear policies regarding data retention and sharing. testbook.com is the 2360th most popular site globally according to Alexa; testbook.com mobile app has 1,000,000 – 5,000,000 downloads. “Thank you for writing in. We are in touch with the customer to ensure that all inappropriate data is deleted and that they update their exclusion rules to comply with our Acceptable Use Policy. “I wanted to follow up and let you know that we fixed the bug associated with the .fs-hide issue and the fix is currently in production as of 4:00 PM EST this afternoon. HTML elements containing the `.fs-hide` selector will no longer record keystrokes. Further, we changed the functionality of the recording code so that it will no longer record the actual keys alongside keystroke data. Thus, any future regression will not run the risk of subtly sending keystroke data to FullStory. Through manual analysis, we found that Mixpanel sends user inputs on a field-by-field basis as soon as the field loses focus. This means that user data is sent to Mixpanel even when the user chooses not to submit a form. Input values that match these filters are excluded from collection by Mixpanel. Comparing Mixpanel’s password field detection heuristics to those of two popular password manager browser extensions (Lastpass and 1Password), we found that Mixpanel’s password detection heuristic is far less comprehensive compared to theirs. For instance, Lastpass and 1Password’s heuristics consider the translation of the word “password” in different languages such as “contraseña”, “passwort”, “mot de passe” or “密码”, when detecting password fields. This is true despite the incentives; if a password manager fails to detect a password field, it’s a usability problem; if Mixpanel fails to detect a password field, it’s a security problem. 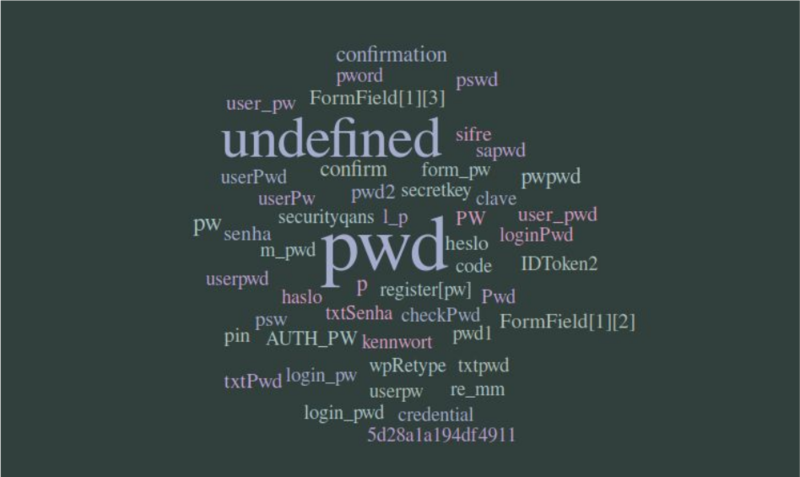 Wordcloud of 50 most common password field name/id attributes that don’t include the substring “pass”, and will thus not be excluded by Mixpanel. This data was collected from a crawl of ~50K sites (~300K page visits). “Undefined” stands for password fields without any name or id attributes. Many of these words are translations of the word “password”, such as: “senha”(Portugese), “sifre” (Turkish), or “kennwort” (German). Mixpanel’s dashboard for enabling Autotrack, before it was disabled for all new projects. Note that there are no warnings of possible sensitive data collection. Credits: Wordcloud image is generated by https://worditout.com. by Steven Englehardt, Gunes Acar, and Arvind Narayanan. Recently we revealed that “session replay” scripts on websites record everything you do, like someone looking over your shoulder, and send it to third-party servers. This en-masse data exfiltration inevitably scoops up sensitive, personal information — in real time, as you type it. We released the data behind our findings, including a list of 8,000 sites on which we observed session-replay scripts recording user data. 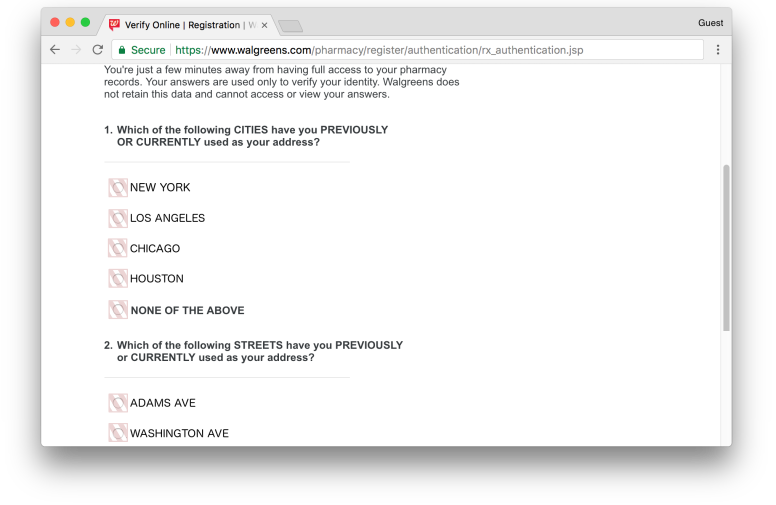 As one case study of these 8,000 sites, we found health conditions and prescription data being exfiltrated from walgreens.com. These are considered Protected Health Information under HIPAA. The number of affected sites is immense; contacting all of them and quantifying the severity of the privacy problems is beyond our means. We encourage you to check out our data release and hold your favorite websites accountable. As one example, a pair of researchers at UC San Diego read our study and then noticed that Gradescope, a website they used for grading assignments, embeds FullStory, one of the session replay scripts we analyzed. We investigated, and sure enough, we found that student names and emails, student grades, and instructor comments on students were being sent to FullStory’s servers. This is considered Student Data under FERPA (US educational privacy law). Ironically, Princeton’s own Information Security course was also affected. We notified Gradescope of our findings, and they removed FullStory from their website within a few hours. You might wonder how the companies’ privacy policies square with our finding. As best as we can tell, Gradescope’s Terms of Service actually permit this data exfiltration , which is a telling comment about the ineffectiveness of Terms of Service as a way of regulating privacy. 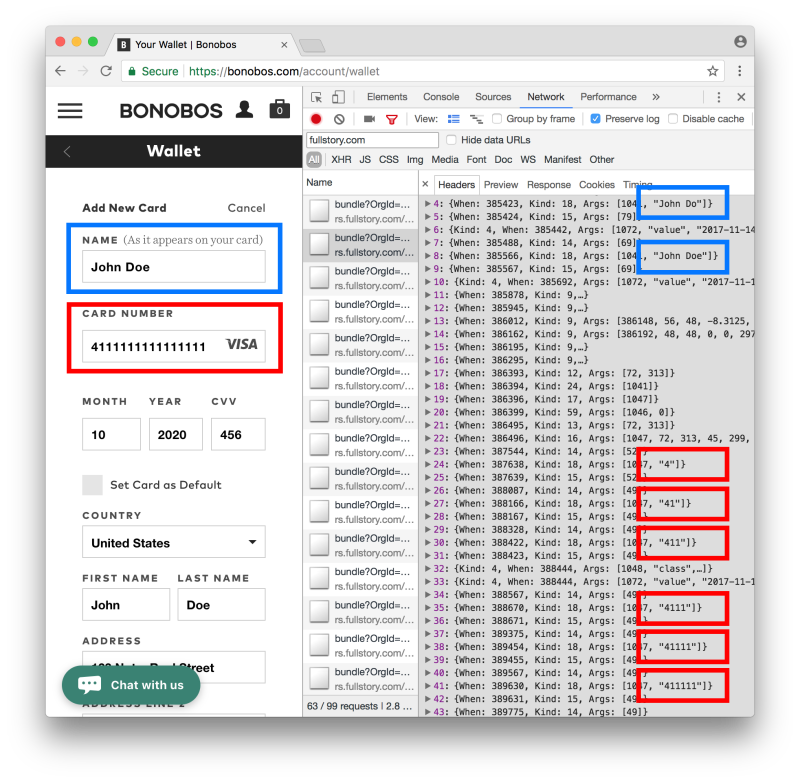 Of the four websites we highlighted in our previous post and this one (Bonobos, Walgreens, Lenovo, and Gradescope), three have removed the third-party scripts in question (all except Lenovo). As far as we can tell, no publisher (website operator) was aware of the exfiltration of sensitive data on their own sites until our study. Further, as mentioned above, Gradescope was unaware of key provisions in FullStory’s Terms of Service. This is a pattern we’ve noticed over and over again in our six years of doing web privacy research. Worse, in many cases the publisher has no direct relationship with the offending third-party script. 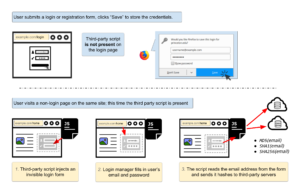 In Part 2 of our study we examined two third-party scripts which exploit a vulnerability in browsers’ built-in password managers to exfiltrate user identities. One web developer was unable to determine how the script was loaded and asked us for help. We pointed out that their site loaded an ad network (media-clic.com), which in turn loaded “themoneytizer.com”, which finally loaded the offending script from Audience Insights. These chains of redirects are ubiquitous on the web, and might involve half a dozen third parties. On some websites the majority of third parties have no direct relationship with the publisher. Most of the advertising and analytics industry is premised on keeping not just users but also website operator in the dark about privacy violations. Indeed, the effort required by website operator to fully audit third parties would negate much of the benefit of offloading tasks to them. The ad tech industry creates a tremendous negative externality in terms of the privacy cost to users. Can we turn the tables? The silver lining is that if we can explain to web developers what third parties are doing on their sites, and empower them to take control, that might be one of the most effective ways to improve web privacy. But any such endeavor should keep in mind that web publishers everywhere are on tight budgets and may not have much privacy expertise. Create a 1-pager summarizing the bare minimum that website operators need to know about web security, privacy, and third parties, with pointers to more information. Create a tailored privacy report for each website based on data that is already publicly available through various sources including our own data releases. Build open-source tools for website operators to scan their own sites . Ideally, the tool should make recommendations for privacy-protecting changes based on the known behavior of third parties. Reach out to website operators to provide information and help make changes. This step doesn’t scale, but is crucial. If you’re interested in working with us on this, we’d love to hear from you! We are grateful to UCSD researchers Dimitar Bounov and Sorin Lerner for bringing the vulnerabilities on Gradescope.com to our attention. The Wayback Machine does not archive FullStory’s Terms page far enough back in time for us to independently verify Gradescope’s statement, nor does FullStory appear in ToSBack, the EFF’s terms-of-service tracker. Privacyscore.org is one example of a nascent attempt at such a tool. In this second installment of the No Boundaries series, we show how a long-known vulnerability in browsers’ built-in password managers is abused by third-party scripts for tracking on more than a thousand sites. The image above shows the process. First, a user fills out a login form on the page and asks the browser to save the login. The tracking script is not present on the login page . Then, the user visits another page on the same website which includes the third-party tracking script. The tracking script inserts an invisible login form, which is automatically filled in by the browser’s login manager. The third-party script retrieves the user’s email address by reading the populated form and sends the email hashes to third-party servers. You can test the attack yourself on our live demo page. We found two scripts using this technique to extract email addresses from login managers on the websites which embed them. These addresses are then hashed and sent to one or more third-party servers. These scripts were present on 1110 of the Alexa top 1 million sites. The process of detecting these scripts is described in our measurement methodology in the Appendix 1. We provide a brief analysis of each script in the sections below. Why does the attack work? All major browsers have built-in login managers that save and automatically fill in username and password data to make the login experience more seamless. The set of heuristics used to determine which login forms will be autofilled varies by browser, but the basic requirement is that a username and password field be available. Login form autofilling in general doesn’t require user interaction; all of the major browsers will autofill the username (often an email address) immediately, regardless of the visibility of the form. Chrome doesn’t autofill the password field until the user clicks or touches anywhere on the page. Other browsers we tested  don’t require user interaction to autofill password fields. Why collect hashes of email addresses? Email addresses are unique and persistent, and thus the hash of an email address is an excellent tracking identifier. A user’s email address will almost never change — clearing cookies, using private browsing mode, or switching devices won’t prevent tracking. The hash of an email address can be used to connect the pieces of an online profile scattered across different browsers, devices, and mobile apps. It can also serve as a link between browsing history profiles before and after cookie clears. In a previous blog post on email tracking, we described in detail why a hashed email address is not an anonymous identifier. “Smart Advertising Performance” and “Big Data Marketing” are the taglines used by the two companies who own the scripts that abuse login managers to extract email addresses. We have manually analyzed the scripts that contained the attack code and verified the attack steps described above. The snippets from the two scripts are given in Appendix 2. Adthink (audienceinsights.net): After injecting an invisible form and reading the email address, Adthink script sends MD5, SHA1 and SHA256 hashes of the email address to its server (secure.audienceinsights.net). Adthink then triggers another request containing the MD5 hash of the email to data broker Acxiom (p-eu.acxiom-online.com). The categories mentioned in the Adthink script include detailed personal, financial, physical traits, as well as intents, interests and demographics (Link to the code snippet). OnAudience (behavioralengine.com): The OnAudience script is most commonly present on Polish websites, including newspapers, ISPs and online retailers. 45 of the 63 sites that contain OnAudience script have “.pl” country code top-level domain. The script sends the MD5 hash of the email back to its server after reading it through the login manager. OnAudience script also collects browser features including plugins, MIME types, screen dimensions, language, timezone information, user agent string, OS and CPU information. The script then generates a hash based on this browser fingerprint. OnAudience claims to use anonymous data only, but hashed email addresses are not anonymous. If an attacker wants to determine whether a user is in the dataset, they can simply hash the user’s email address and search for records associated with that hash. For a more detailed discussion, see our previous blog post. Is this attack new? This and similar attacks have been discussed in a number of browser bug reports and academic papers for at least 11 years. Much of the previous discussion focuses on the security implications of the current functionality, and on the security-usability tradeoff of the autofill functionality. Several researchers showed that it is possible to steal passwords from login managers through cross-site scripting (XSS) attacks [3,4,5,6,7]. Login managers and XSS is a dangerous mixture for two reasons: 1) passwords retrieved by XSS can have more devastating effects compared to cookie theft, as users commonly reuse passwords across different sites; 2) login managers extend the attack surface for the password theft, as an XSS attack can steal passwords on any page within a site, even those which don’t contain a login form. How did we get here? You may wonder how a security vulnerability persisted for 11 years. That’s because from a narrow browser security perspective, there is no vulnerability, and everything is working as intended. Let us explain. The web’s security rests on the Same Origin Policy. In this model, scripts and content from different origins (roughly, domains or websites) are treated as mutually untrusting, and the browser protects them from interfering with each other. However, if a publisher directly embeds a third-party script, rather than isolating it in an iframe, the script is treated as coming from the publisher’s origin. Thus, the publisher (and its users) entirely lose the protections of the same origin policy, and there is nothing preventing the script from exfiltrating sensitive information. Sadly, direct embedding is common — and, in fact, the default — which also explains why the vulnerabilities we exposed in our previous post were possible. This model is a poor fit for reality. Publishers neither completely trust nor completely mistrust third parties, and thus neither of the two options (iframe sandboxing and direct embedding) is a good fit: one limits functionality and the other is a privacy nightmare. We’ve found repeatedly through our research that third parties are quite opaque about the behavior of their scripts, and at any rate, most publishers don’t have the time or technical knowhow to evaluate them. Thus, we’re stuck with this uneasy relationship between publishers and third parties for the foreseeable future. The browser vendor’s dilemma. It is clear that the Same-Origin Policy is a poor fit for trust relationships on the web today, and that other security defenses would help. But there is another dilemma for browser vendors: should they defend against this and other similar vulnerabilities, or view it as the publisher’s fault for embedding the third party at all? There are good arguments for both views. Currently browser vendors seem to adopt the latter for the login manager issue, viewing it as the publisher’s burden. In general, there is no principled way to defend against third parties that are present on some pages on a site from accessing sensitive data on other pages of the same site. For example, if a user simultaneously has two tabs from the same site open — one containing a login form but no third party, and vice versa — then the third-party script can “reach across” browser tabs and exfiltrate the login information under certain circumstances. By embedding a third party anywhere on its site, the publisher signals that it completely trusts the third party. Yet, in other cases, browser vendors have chosen to adopt defenses even if necessarily imperfect. For example, the HTTPOnly cookie attribute was introduced to limit the impact of XSS attacks by blocking the script access to security critical cookies. There is another relevant factor: our discovery means that autofill is not just a security vulnerability but also a privacy threat. While the security community strongly prefers principled solutions whenever possible, when it comes to web tracking, we have generally been willing to embrace more heuristic defenses such as blocklists. Countermeasures. Publishers, users, and browser vendors can all take steps to prevent autofill data exfiltration. We discuss each in turn. Publishers can isolate login forms by putting them on a separate subdomain, which prevents autofill from working on non-login pages. This does have drawbacks including an increase in engineering complexity. Alternately they could isolate third parties using frameworks like Safeframe. Safeframe makes it easier for the publisher scripts and iframed scripts to communicate, thus blunting the effect of sandboxing. Any such technique requires additional engineering by the publisher compared to simply dropping a third-party script into the web page. Users can install ad blockers or tracking protection extensions to prevent tracking by invasive third-party scripts. The domains used to serve the two scripts (behavioralengine.com and audienceinsights.net) are blocked by the EasyPrivacy blocklist. Now we turn to browsers. The simplest defense is to allow users to disable login autofill. For instance, the Firefox preference signon.autofillForms can be set to false to disable autofilling of credentials. A less crude defense is to require user interaction before autofilling login forms. Browser vendors have been reluctant to do this because of the usability overhead, but given the evidence of autofill abuse in the wild, this overhead might be justifiable. The upcoming W3C Credential Management API requires browsers to display a notification when user credentials are provided to a page . Browsers may display the same notification when login information is autofilled by the built-in login managers. Displays of this type won’t directly prevent abuse, but they make attacks more visible to publishers and privacy-conscious users. Finally, the “writeonly form fields” idea can be a promising direction to secure login forms in general. The briefly discussed proposal defines ways to deny read access to form elements and suggests the use of placeholder nonces to protect autofilled credentials . Built-in login managers have a positive effect on web security: they curtail password reuse by making it easy to use complex passwords, and they make phishing attacks are harder to mount. Yet, browser vendors should reconsider allowing stealthy access to autofilled login forms in the light of our findings. More generally, for every browser feature, browser developers and standard bodies should consider how it might be abused by untrustworthy third-party scripts. We found that login pages contain 25% fewer third-parties compared to pages without login forms. The analysis was based on our crawl of 300,000 pages from 50,000 sites. We tested the following browsers: Firefox, Chrome, Internet Explorer, Edge, Safari. To study password manager abuse, we extended OpenWPM to simulate a user with saved login credentials and added instrumentation to monitor form access. We used Firefox’s nsILoginManager interface to add login credentials as if they were previously stored by the user. We did not otherwise alter the functionality of the password manager or attempt to manually fill login forms. 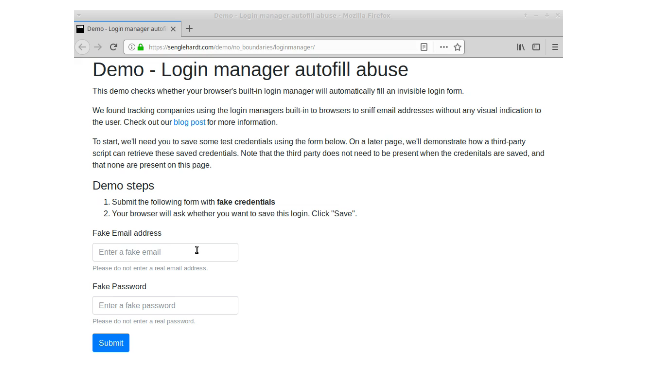 This allowed us to capture actual abuses of the browser login manager, as any exfiltrated data must have originated from the login manager. We crawled 50,000 sites from the Alexa top 1 million. We used the following sampling strategy: visit all of the top 15,000 sites, randomly sample 15,000 sites from the Alexa rank range [15,000 100,000), and randomly sample 20,000 sites from the range [100,000, 1,000,000). This combination allowed us to observe the attacks on both high and low traffic sites. On each of these 50,000 sites we visited 6 pages: the front page and a set of 5 other pages randomly sampled from the internal links on the front page. Mutation events to monitor elements inserted to the page DOM. This allowed us to detect the injection of fake login forms. When a mutation event fires, we record the current call stack and serialize the inserted HTML elements. Instrument HTMLInputElement to intercept access to form input fields. We log the input field value that is being read to detect when the bait email (autofilled by the built-in password manager) was sniffed. Store HTTP request and response data, including POST payloads to detect the exfiltration of the email address or password. To verify the findings of the automated experiments we manually analyzed sites that embed the two scripts that match these conditions. We have verified that the forms that the scripts inserted were not visible. We then opened accounts on the sites that allow registration and let the browser store the login information (by clicking yes to the dialog in Figure 1). We then visited another page on the site and verified that browser password manager filled the invisible form injected by the scripts. To supplement automated redaction, several of the session recording companies, including Smartlook, Yandex, FullStory, SessionCam, and Hotjar allow sites to further specify inputs elements to be excluded from the recording. To effectively deploy these mitigations a publisher will need to actively audit every input element to determine if it contains personal data. This is complicated, error prone and costly, especially as a site or the underlying web application code changes over time. For instance, the financial service site fidelity.com has several redaction rules for Clicktale that involve nested tables and child elements referenced by their index. In the next section we further explore these challenges. 3. Manual redaction of personally identifying information displayed on a page is a fundamentally insecure model. In addition to collecting user inputs, the session recording companies also collect rendered page content. Unlike user input recording, none of the companies appear to provide automated redaction of displayed content by default; all displayed content in our tests ended up leaking. Instead, session recording companies expect sites to manually label all personally identifying information included in a rendered page. Sensitive user data has a number of avenues to end up in recordings, and small leaks over several pages can lead to a large accumulation of personal data in a single session recording. For recordings to be completely free of personal information, a site’s web application developers would need to work with the site’s marketing and analytics teams to iteratively scrub personally identifying information from recordings as it’s discovered. Any change to the site design, such as a change in the class attribute of an element containing sensitive information or a decision to load private data into a different type of element requires a review of the redaction rules. 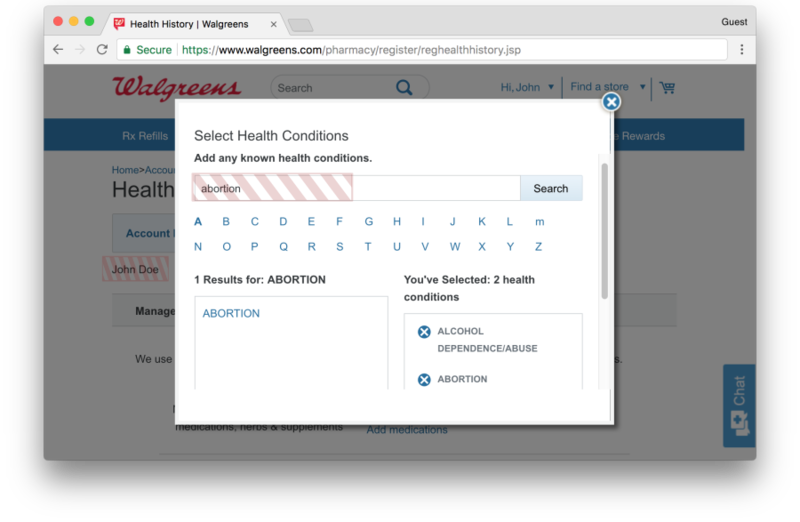 As a case study, we examine the pharmacy section of Walgreens.com, which embeds FullStory. Walgreens makes extensive use of manual redaction for both displayed and input data. 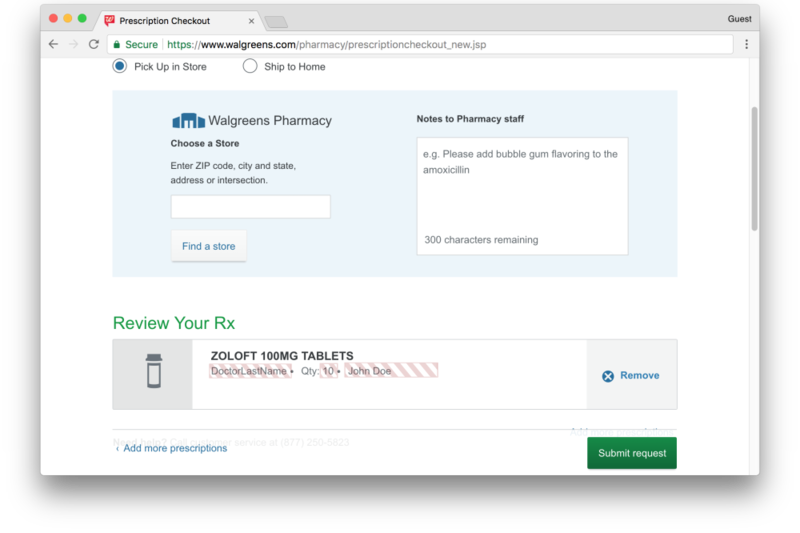 Despite this, we find that sensitive information including medical conditions and prescriptions are leaked to FullStory alongside the names of users. We do not present the above examples to point fingers at a certain website. Instead, we aim to show that the redaction process can fail even for a large publisher with a strong, legal incentive to protect user data. 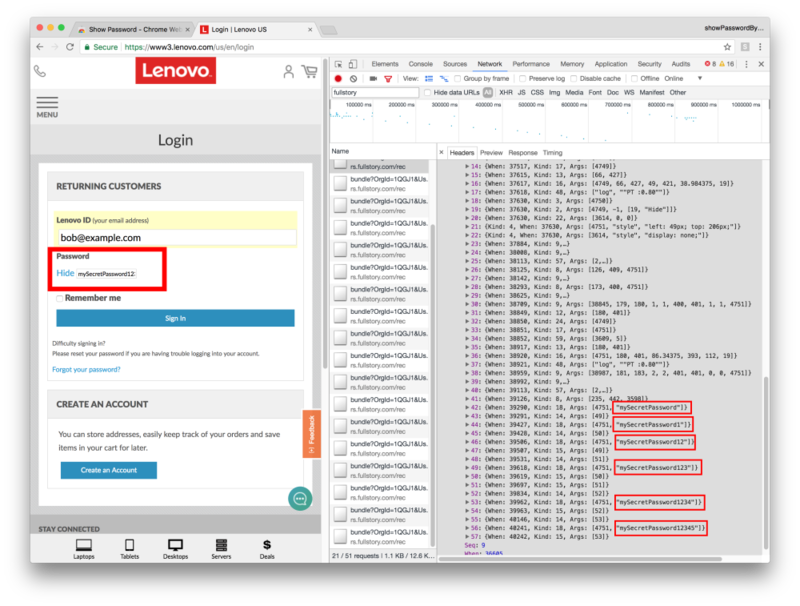 We observed similar personal information leaks on other websites, including on the checkout pages of Lenovo . Sites with less resources or less expertise are even more likely to fail. 4. Recording services may fail to protect user data. Recording services increase the exposure to data breaches, as personal data will inevitably end up in recordings. These services must handle recording data with the same security practices with which a publisher would be expected to handle user data. We provide a specific example of how recording services can fail to do so. Once a session recording is complete, publishers can review it using a dashboard provided by the recording service. The publisher dashboards for Yandex, Hotjar, and Smartlook all deliver playbacks within an HTTP page, even for recordings which take place on HTTPS pages. This allows an active man-in-the-middle to injecting a script into the playback page and extract all of the recording data. Worse yet, Yandex and Hotjar deliver the publisher page content over HTTP — data that was previously protected by HTTPS is now vulnerable to passive network surveillance. The vulnerabilities we highlight above are inherent to full-page session recording. That’s not to say the specific examples can’t be fixed — indeed, the publishers we examined can patch their leaks of user data and passwords. The recording services can all use HTTPS during playbacks. But as long as the security of user data relies on publishers fully redacting their sites, these underlying vulnerabilities will continue to exist. Two commonly used ad-blocking lists EasyList and EasyPrivacy do not block FullStory, Smartlook, or UserReplay scripts. EasyPrivacy has filter rules that block Yandex, Hotjar, ClickTale and SessionCam. At least one of the five companies we studied (UserReplay) allows publishers to disable data collection from users who have Do Not Track (DNT) set in their browsers. We scanned the configuration settings of the Alexa top 1 million publishers using UserReplay on their homepages, and found that none of them chose to honor the DNT signal. Improving user experience is a critical task for publishers. However it shouldn’t come at the expense of user privacy. We use the term ‘exfiltrate’ in this series to refer to the third-party data collection that we study. The term ‘leakage’ is sometimes used, but we eschew it, because it suggests an accidental collection resulting from a bug. Rather, our research suggests that while not necessarily malicious, the collection of sensitive personal data by the third parties that we study is inherent in their operation and is well known to most if not all of these entities. Further, there is an element of furtiveness; these data flows are not public knowledge and neither publishers nor third parties are not transparent about them. We used OpenWPM to crawl the Alexa top 50,000 sites, visiting the homepage and 5 additional internal pages on each site. We use a two-step approach to detect analytics services which collect page content. First, we inject a unique value into the HTML of the page and search for evidence of that value being sent to a third party in the page traffic. To detect values that may be encoded or hashed we use a detection methodology similar to previous work on email tracking. After filtering out leak recipients, we isolate pages on which at least one third party receives a large amount of data during the visit, but for which we do not detect a unique ID. On these sites, we perform a follow-up crawl which injects a 200KB chunk of data into the page and check if we observe a corresponding bump in the size of the data sent to the third party. We found 482 sites on which either the unique marker was leaked to a collection endpoint from one of the services or on which we observed a data collection increase roughly equivalent to the compressed length of the injected chunk. We believe this value is a lower bound since many of the recording services offer the ability to sample page visits, which is compounded by our two-step methodology. One company (Clicktale) was excluded because we were unable to make the practical arrangements to analyze script’s functionality at scale. Lenovo.com is another example of a site which leaks user data in session recordings. We used the default scripts available to new accounts for 5 of the 6 providers. For UserReplay, we used a script taken from a live site and verified that the configuration options match the most common options found on the web. Are you really anonymous online?